The thought of writing a book is daunting, especially if you don’t consider yourself a writer. It can take quite a bit of mental energy writing an email to your boss, but writing 60,000 words on your business philosophy? Forget about it. Writing a book, however, is something every entrepreneur should consider. 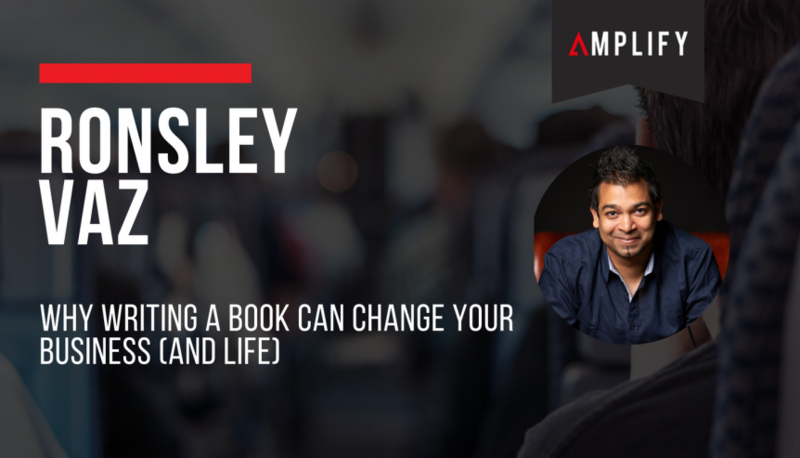 On a recent episode of the Copy That Pops podcast with Laura Petersen, Amplify CEO Ronsley Vaz explained how his recent foray into writing a book was one of the best business decisions he’s made in a long time. Ronsley decided to write a book while in a meeting with a high-level executive at a company we won’t name. He noticed a pile of business cards on the person’s desk, who then explained that they were just from a couple of week’s worth of meetings. To stand out, Ronsley realised, he would need a much bigger business card. That’s where writing a book came in. Most people associate being an author with household name CEOs, or creative writers, or academics. But even if you’re an entrepreneur with not much experience behind you and maybe a few good ideas — writing can be a great way to expand your reach. People who read your book will be that much more invested in your business. Even if people don’t read your book — and they will, don’t worry — having the title of “published author” attached to your name will work wonders for your credibility. This doesn’t necessarily mean that every person that pumps out a bunch of words is an expert. But anyone who writes a good, well-reviewed book has clearly taken the time to develop a theory of business, or anything else, that resonates with people and is worth taking a look at. If you’re going to write a book, make sure you consider audio. Ronsley says that audio consumption was set to cross 12 billion hours in 2018. We’re busy people, many of whom don’t have the time to sit down and digest a book by itself. We listen to audiobooks on the train, in the car or while at the gym. If you want to have your message heard, don’t ignore the platform. On top of the benefits it has for your business, writing is its own form of catharsis and affirmation in your beliefs. They say the best way to learn something is to teach it. But another great way to really understand something is to flesh it out into coherent, engaging copy. Is there a better way to cement your legacy as a thought leader than by putting your thoughts out there for everyone to see? Listen to my entire conversation with Laura here.